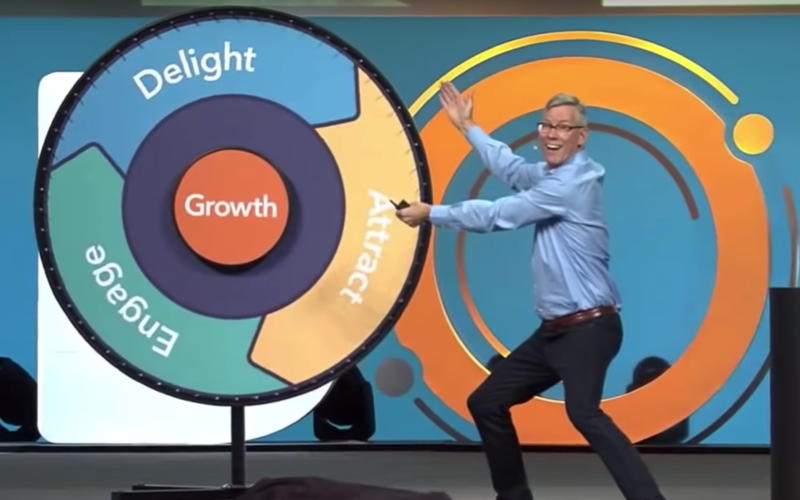 At the Inbound 18 conference in Boston this year, HubSpot bravely retired the concept of using a funnel as a model for growth, and replaced it with a flywheel. 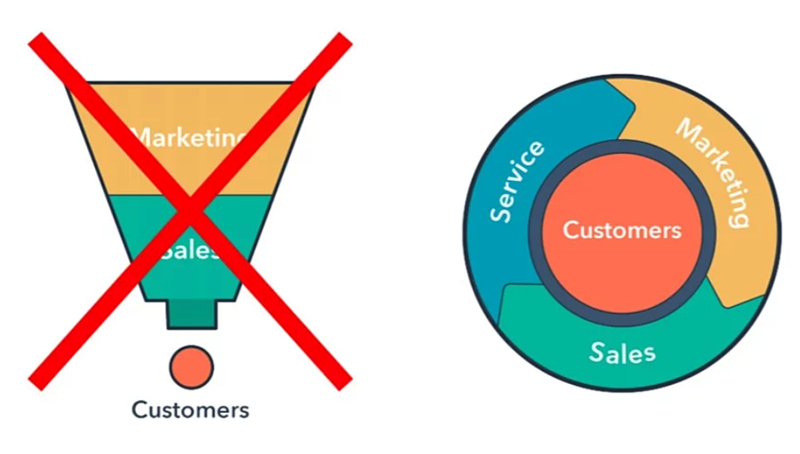 The concept of the funnel as a visual and data-centric model for turning prospects into customers has been around a very long time (all my career), so why did HubSpot see the need to replace it? In his keynote presentation, Brian Halligan, CEO of HubSpot, noted that cracks were appearing in the traditional funnel model, mainly due to changes happening to the buying process and the buyers journey. He argued it was time to change, and that customers are not an output, dropping out at the bottom of the funnel, like they are part of a production line system. But rather, customers are a very valued input into our business, and company growth can depend on how customer-centric we are, how we treat our customers, and the overall experience they have with your brand. To rely on the concept of the funnel alone, was misleading, there are many, many new technologies being introduced that circumvents the funnel process, such as messaging, reviews and social media, over which the marketing team had less influence and control, with fewer metrics. The funnel concept didn't take these 'other' marketing methods into account, nor did it factor in traditional 'word of mouth' as an important part of the 'growth' process. Therefore Halligan proposed an alternative model for growth. Over at Amazon, Jeff Bezos described growth like this ... We increase the selection, the more selection we have, the better the customer experience, and of course the better the customer experience the more traffic and word-of-mouth, the more traffic and word-of-mouth, the more sellers and so forth and so on. He referred to this Amazon growth process as a flywheel. It's basically a circle, so why did he refer to it as a flywheel? a mechanical device specifically designed to efficiently store rotational energy. It became a key technology that enabled the steam engine to happen, which amazingly enabled the whole industrial revolution to happen. The flywheel has now become the new business growth metaphor at HubSpot, and represents how the HubSpot platform is customer-centric (with the CRM and its data in the middle), with the main front office business areas of marketing, sales and service, revolving around the customer in the middle. There are a couple things I like about the flywheel, and it's holistic view of business growth, which make it way better than the old funnel concept. Firstly, it's got customers in the right place, they're in the middle of the model - in the centre of your business - and that's a very good thing. It's got a sense of mutual dependency, motion and energy - where marketing, sales and service, all revolve around the central 'hub', and they can all influence each other. How then is the flywheel a model for business growth? Let's take this up a notch, so how do we put that flywheel model to work for your business? We need to think about the holistic nature of business, and how can we grow it into 2019 and beyond. James Watt, the physicist, would say there are three important things to look at with a flywheel. The first, is you need to apply a force, or energy, to your flywheel to make it move. This is a very simple idea - if you apply tangent forces to the flywheel it spins, the more force you apply, the faster it spins. One of the biggest challenges in marketing these days, is where best to spend your energy to get a good return on your investment? Where should you apply your best marketing efforts and talents to get the biggest return? Traditionally 20 years ago, sales reps ruled - they sold to you. Then in 2010 the customer took over, they changed the way they wanted to buy, they took control of the buying process and found helpful Google information on their own time. It therefore became the role of marketing to provide lots of helpful information (content), and get ranked on Google. Now in 2018 ... we want to give our customers the best possible service and experience, which sometimes is a totally self-service experience. Consequently, service is now making the most noise in the channel and potentially, service can have the biggest impact on delighting the customer - and the biggest impact on your business. Service is no longer to be thought of as a low-cost, end of the customer journey commodity, it's actually a very valued part of your operations, and brand - and it has to deliver the best possible experience your customer is looking for. The funnel model worked well with sales and marketing, all they really wanted to do was close as many leads, deals and sales as possible. Frankly, back then, customer delight was an almost an afterthought, and another department somewhere else in the building. But, the reality is, if you deliver a superior customer experience, as part of your sales, marketing and service offering, and focus on delighting your customers, making them happy, your business can really take-off, and your business will grow. Developing a fantastic customer experience, before, during and after the sale, is the new battleground for Inbound. Here at The Brit Agency, we call it the "Inbound Experience" as I believe the basic tenets and principles of Inbound apply very well to developing the right type of organization to adopt a true customer experience culture. [Note to self - I'm going to write a blog on this topic]. Think of some of the companies out there who you have recently dealt with, who have totally nailed the customer experience from the beginning of your buying journey to the end (if there is an end? [another potential blog idea!]). Think Casper, Amazon, Apple, Fedex, Dollar Shave Club, Disney, Netflix, and many of the big luxury brands who are all very focused on delivering the overall customer experience. The second thing you want to do is put a force on the flywheel. But before you do, you will really want to lower the friction in your flywheel so that if you just barely touch it, it spins really easily. If you want to gain a competitive advantage against your competitors, you will want to disrupt incumbents by lowering the friction prospects and customers have when doing business with you. One of the critical success factors of successful customer experience companies, like the ones mentioned above, is lowering friction - those companies make it really easy for you to do business with them - they're frictionless. If you want to build a great company, the customer experience you offer, has to have less friction than the competition. This is where the business rules are really changing. It used to be that the best products won. Now it's the best customer experience that wins. It used to be what you sold that really mattered, now it's how you market, sell and service. If you have any friction within your business, it can rub up against your customers, so you will need to reduce it. What if 80% of your customer interactions were self-service? That would mean your total business friction would be massively reduced. To do this, you can turn your IT investments on its head and invest in self service technologies, and stop investing in making people more effective. Friction primarily tends to be a human interaction thing, so it makes total sense that in the business of the future, employees are involved less in the customer interaction process. If you want to build a high-growth business using the flywheel model, you have got to lower your customer friction and you should see faster growth. What does your customer experience look like? Professional Tip - A good starting point is to assess the customer experience you offer by travelling the buying journey your customers take – not just from the perspective of the product or service you sell, but every touch point surrounding the buyers journey. To craft an ideal and competitively stronger customer experience, you might need to examine your marketing, sales and service experiences, and the hand-off between each area. How much friction was there along the way? It's well worth looking at this holistically, from the perspective of your whole company’s interaction with each customer. Extracts of this blog are taken from notes made at the Brian Halligan keynote speech, Inbound 18, Boston, 2018. If you're interested in learning more about how The Brit Agency could help your customer experience, Contact Us now and discover new ways to improve the overall digital experience you offer your customers. THE BRIT AGENCY is a B2B Inbound Agency providing Inbound Marketing, Inbound Website Design, and Inbound Sales services to companies around the world. We're focused on generating website traffic, qualified leads and sales, using the Inbound lead generation and marketing automation process, and building a buyers journey that can deliver the best customer experience. THE BRIT AGENCY is a Certified Platinum Hubspot Partner, a HubSpot CMS and GDD certified Hubspot Design Agency, a HubSpot Certified Trainer, a Shopify eCommerce Partner, and a certified "Google Badged Agency Partner". We have offices in Toronto and Barrie, Canada ... and Salisbury, UK.